Steelmaking is at the heart of British industry and has provided evocative and poetic subject matter for filmmakers throughout the twentieth century. Drawn from the BFI National Archive and those of partner archives, including Scottish Screen Archive and the National Screen and Sound Archive of Wales, the films on this set bring alive the stories of the communities shaped by the steel industry, offering revelations about its highly skilled workforce and some of the breathtaking feats which the industry routinely achieved. The recent decline of the steel industry is brought into sharp focus through this richly fascinating and often surprising view of a largely vanished way of life. Steel: A Century of Steelmaking on Film is a double-DVD box set is the third and final release in the BFI's This Working Life series which showcases rarely seen films which explore Britain's rich industrial heritage. These rare documentaries, short subject and animated works date from 1901 to 1987 and chart the extraordinary story of steel. Highlights include silent footage of intrepid construction in The Building of the New Tyne Bridge (1928) – with a newly commissioned music by Newcastle-based band Jazzfinger – and the great rediscovery of the 1945 film Steel, shot in Technicolor by the Oscar-winning cinematographer Jack Cardiff. Newly restored, Steel chronicles the visually spectacular process of making steel, from iron ore to the steelworks. Other films include the witty animation River of Steel (1951), which shows how we all depend on steel, Men of Consett (1959), a wonderfully odd film directed by explorer, cameraman and food writer Tom Stobart, who ventures into the steel community in Consett, County Durham, and Women of Steel (dir Jenny Woodley, 1984) which gives a rare insight into women's role in the steel industry in wartime Sheffield. 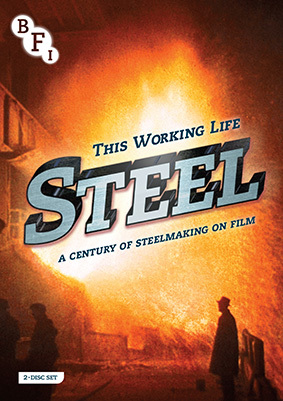 Steel: A Century of Steelmaking on Film will be released on UK DVD as a 2-disc set by the BFI on 18th February 2013 at the RRP of £29.99. The set includes a comprehensive illustrated booklet with film notes and essays by BFI curators and a foreword by Professor Mark Miodownik.